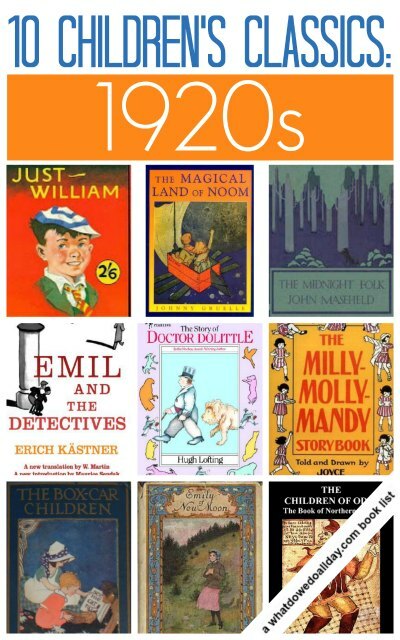 For my next book list in the Classic Children’s Books series we are headed into the Roaring Twenties! 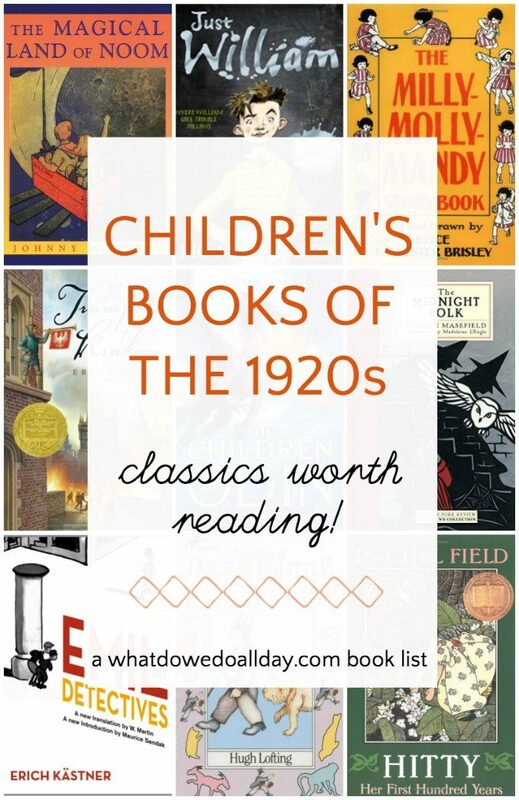 I love this collection of children’s books from the 1920s and I think you may even find some books that are new to you! As with my previous classic book posts, this list is not meant to be a “top 10” book list — otherwise you might see heavy-hitters like Winnie-the-Pooh. 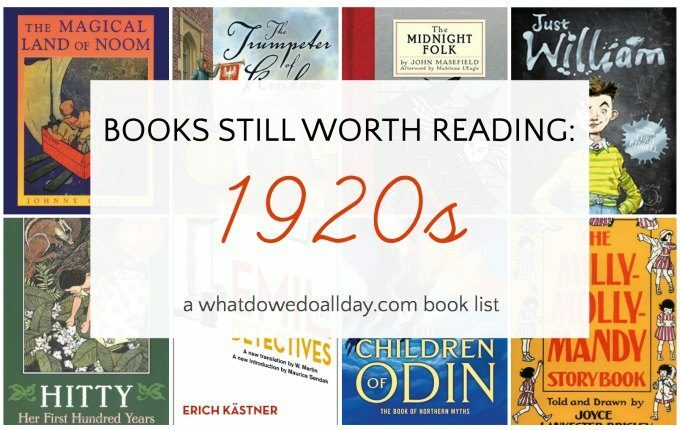 But since you already know about Winnie, here are 10 books from the 1920s which are less likely to be on your radar and still worth reading. Don’t forget, that while reading classics is still worthwhile, books can contain problematic representations and stereotypes. Please discuss these openly with your children! We want kids to be informed readers and recognize where we’ve gone wrong as well as what we’ve done right! The Milly-Molly-Mandy Storybook by Joyce Lankester Brisley. (1928) Thank goodness fellow bloggers introduced me to these stories. The storybook contains 21 stories of old-fashioned fun perfectly formulated to make you smile. Unlike a lot of books on my Classic Children’s Books lists, this one is terrific for even the youngest children. Just William. (1922) William and his ragtag group of friends create hilarious mayhem wherever they go, usually at the expense of self-serving adults. This is the first book in a well-know British series of William stories. At Project Gutenberg. Emil and the Detectives by Erich Kästner. (1929) This German novel was was of the first books to feature a juvenile detective. When Emil is sedated with laced chocolate and robbed on a train of his grandmother’s money he doesn’t want to let his family down and sets out to solve the crime himself. Fast-paced and suspenseful, this story will keep young readers (or listeners) eager for the resolution. The Story of Doctor Dolittle by Hugh Lofting. (1920) This seems to be one of those books that everyone has heard of but few have read. Don’t do yourself that disservice, you’ll meet a host of interesting characters including the intriguing pushmi-pullyu. There are twelve Dolittle books, this is the first and the second, The Voyages of Doctor Dolittle, won the Newbery in 1922. The Trumpeter of Krakow by Eric P. Kelly. (1929) Don’t let the awful cover above put you off this book. The combination of 15th century Poland, alchemy, the Philosopher’s Stone (sound familiar? ), intrigue and a villain named “Peter the Button Face” won a Newbery for author Eric P. Kelly. Emily of New Moon. (1923) This is the first in a trilogy about the sensitive Emily, an orphan who now lives with her less-than-sensitive relatives. She grows to love her new home, however, thanks to the companionship of some special friends. The second book, Emily Climbs is particularly good. There is an HTML only text at Project Gutenberg Australia. This book is out of copyright, so I’m hopeful it will be PG USA soon. In the meantime here are all of the available books by L.M. Montgomery at Project Gutenberg. Hitty, Her First Hundred Years by Rachel Field. (1929) A story told entirely from a doll’s point of view. Hitty travels the globe, getting lost and found in unusual places. A Newbery Medal book. The Children of Odin: The Book of Northern Myths. (1920) Myths and legends of all cultures should be part of every child’s literary heritage. Although Padriac Column did win two Newbery medals for other works, I chose to include this book since I love all things Nordic. At Project Gutenberg (you can find all his available books at Project Gutenberg here). The Midnight Folk. (1927) UK Poet Laureate penned this intriguing tale. Young Kay Harker embarks on a hunt to find his grandfather’s treasure in this suspenseful and fantastical story. On his journey, which begins every night at midnight he encounters magical, imaginative beings like witches, mermaids and talking toys. The Magical Land of Noom. (1922) Best known for his Raggedy Ann and Andy stories, Johnny Gruelle also wrote this magical story of siblings, Johnny and Janey, who build a flying machine and explore a magical world with… (wait for it..) their grandparents. Fans of the Raggedy books will recognize a lot of Gruelle’s trademark magical food plants and quirky imps. This book is no longer under copyright, but I could not locate a free online edition. We love Milly Molly Mandy too. The Storybook must be a collection of a couple of books-we have four individual books with 7 to 13 stories in each. Unfortunately the titles aren't especially memorable: Milly Molly Mandy stories, More of Milly Molly Mandy, Milly Molly Mandy again and Further doings of Milly Molly Many. It is a collection and it's the copy I read since that was the edition our library finally obtained. The Milly-Molly-Mandy stories were among my mother’s books she read as a child, and consequently the first books I read by myself. I loved them and have all four in the series. They are still being published in the UK because they are still very popular there. I've only read the Emily books. How embarrassing! These lists are really an amazing resource BECAUSE you're leaving off some of the big titles. I want new ideas, and that's what you're giving me. Thank you! I've read Emily, but only the first one (loved it), and I'm most intrigued by the Milly-Molly-Mandy Storybook. Thanks, Amy. That's my objective: we've all heard of Winnie the Pooh, I don't need to tell you about it! Great list AGAIN! I loved milly-molly-mandy growing up and still have my old childhood copies but have totally failed to get my kids interested in them. Also love the Emily books and the MIdnight Folk (and the Box of Delights) and we have the Emil books in German. Haven't ever heard of the Trumpeter of Krakow but looking forward to checking it out! Thanks for your comment, Jen. I read The Trumpeter of Krakow in school when I was a kid. I also really enjoy this trip through the time. See, I guessed correctly that you will have Emil on the list 🙂 This is actually the only book from this list I've ever heard of. Oh, yes, and The Boxcar Children, of course. I didn't know it's that old! I'm loving your lists too. Thanks, they are really fun to make. These are some wonderful lists that you are compiling. Are you part of my “Book List” Pinterest board because I would love to add you if you are not. I know that I read Emily of New Moon multiple times as a kid. What do you think about the new Boxcar Children prequel that's going to be released soon? So many great books and I've only read half of the ones on this list – gotta get to the library! I enjoyed Hitty – it reminded me quite a lot of The Incredible Journey of Edward Tulane. As a huge kids lit reader, I am loving this series! Thanks Jacquie. It has been a really fun series to put together. I see you've also been sharing in on Pinterest — thanks for that! Do you have a respond em for finding old books? I am looking your one rom the 1920s called “the amazing adventures of Anthony ant”. Unfortunately, I’ve not heard of this book. I believe you’re looking for “Ant Ventures” by Blanche Elizabeth Wade. One of my favorites is Billy Whiskers (there are several titles). My grandpa loved it as a kid and had old copies from when my dad was a kid. I love your blog. One thing though. The Boxcar Children that is on the shelves today – the one almost everyone has read- was published in 1942. The orginal book, published as The Box-Car Children, in 1924, is not the same book…It’s almost a different manuscript altogether. The 1924 one is much, much longer, and more difficult to read…many events are different…and the names are different too. The kids don’t even have the same last name- their last name is Cordyce, not Alden. There are additional events that aren’t in the 1942 book, such as a chapter about the Cordyce children’s father being an alcoholic, going to bars, and eventually dying in their home and the children have to go get help from a neighbor because their dad died in their home. Sooo, lol, the book was not very successful! Not many copies were printed and now it’s nearly impossible to find. I got one on eBay but it cost a ton. In 1942, the book was published by a different company, and it was re-written to be shorter and simpler to read, and to be sanitized for children to read. Anyway the 1924 one is nearly impossible to find at any decent price, but if you can get a hole of it, it’s nothing like the Boxcar Children from 1942. So interesting! I never knew. I grew up in the author’s hometown in Connecticut. She was a school teacher and my mother knew her. There was always excitement when a new book in the series came out and there would be signed copies to buy in the bookstore in town. So many details of the landscape in the 1942 book are drawn from the area around our home. When we were kids, reading the books, it felt so familiar. We did similar things, like make beds of pine needles and dam streams to make wading pools. Warner also published a wonderful version of 1001 Nights. I had always thought William had few fans inn the USA. Do tell me when you first discovered him and how many other people you know who enjoy the books. I am looking for a book that my father read in the 1930s about a mouse that visits a museum and talks with all the exhibits. He says it was a chapter book and probably had an orange cover. . .can you help? I’d really like to find this book for him. Thank you so much! That sounds like a fun book, but I haven’t read anything like that. Good luck with your search. Might it be “The Museum Comes to Life” by Maribelle Cormack and William P. Alexander? I’m sorry, I don’t know that book. Great list!Are you familiar with Open Library? my favourite resource for old books to read online. You can borow books for 2 weeks at a time,and renew if nobody else wants them. All the bookson the list are available,apart from Ant Ventures.lol.They are scans of the original books,so rather brown and dark and the website is a bit clunky to use,but at least rare and rather obscure books Over 28,000 childrens books! are available to read for free.I can get lost for ages just clicking from book to book! lol. Ohand btwThey have at least half a dozen of Grace Moon’s Indian stories.